Get all the features of a skimo top without those unsightly arms (sold separately, tic). Stuff your skins in your shirt without taking off your pack. Store your hydration next to your heat center so it doesn’t freeze up. Secure you beacon, headlamp, and energy in specially designed compartments. All this with a stretchy slim fit covering just your important parts. If elbow freedom is your cause, this is the top to rally around. Easy-access skin pocket on the front left is a good place to warm up your glue. Shoulder reinforcements support your pack while a ventilated back hides under it. Bottle holder on the front right offers no excuses for not staying hydrated. Handy internal stomach pockets help you stay organized and fueled. Secure pockets for avalanche beacon and headlamp round out the complete design. I have used this vest for a season of training and routine backcountry use. It seems to be a euro fit with an extra long length. I am a 39-41 ish chest and 6'4". The EU XL/US L fits nice and snug and is quite long, never slipping up over my pants. The fabric breathes well and can be layerd over or under easily. The zipper is a little tough to get started with gloves on but after that the large pull and high neck make it easy to adjust based off of exertion and solar heat. There is an internal beacon pocket that works very well for the intended purpose- way better than a beacon harness. I just keep my beacon in the pocket permanently now so it is always ready to go. The zipper pull is a little tough with gloves on though. 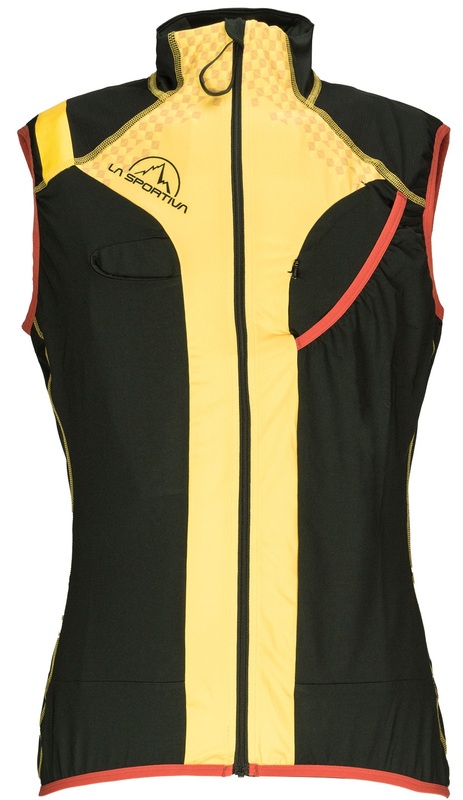 The single skin pocket is perfect for a pair of race skins or even slightly larger skins. I have used it with 80mm widex170cm skins with only a little difficulty. These larger skins work in the pocket best only with care during your folding to ensure no glue is exposed! The pocket is quite deep but if you have a waist belt on it cuts off about 1/4 to 1/3 of the pocket depth which is not too big a deal but something to keep in mind especially if you are wearing an airbag pack and must have the hip belt on snug. Speaking of airbags, the shortened pocket causes one possibly minor issue with my airbag handle. If Im not careful I get one or both skin bungees sticking out of the pocket right in the way of the airbag handle. Someting to be mindful of. Additionally, that airbag handle can slip partially into the arm hole of the vest if you don't dial in the adjustment. This is all mitigatable, just a heads up that I think vests in general have an additional consideration when it comes to airbags. The wearers right chest has a pocket that is supposed to fit a soft flask. It sure doesn't fit mine but it is OK to store a few gels or one or two bars in. This is the one kind of annoying feature. It is space that could have been better thought out. Being able to stash food for more than about a 2-3 hour stint would have been pretty cool. There are no other pockets so you can't stash much in this vest. Maybe 1/4 to 1/3 of what you could stash in a race suit top? But it is very versatile and a great stealth alternative to being "that guy" in the spandex onesy!